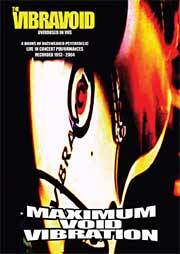 Vibravoid - "Maximum Void Vibration"
This is a limited edition DVD (300 copies only) and quite a steal as you get 4½ hours of stuff spanning the bands whole career (93-2004). This is true psychedelic rock with far out lights and spaced out music including a few covers of Pink Floyd, Arthur Brown and others. The complete concert from the Swamp Room Happening 2002 is one of the best parts of the DVD. All the stuff here was nicely transferred from VHS tapes and edited together in a very professional way. If you are a fan of the band, you will for sure enjoy this! For more information you can visit the Vibravoid web site at: http://www.vibravoid.de.